Engineering is Humanity, Electronics is Religion. Ecstuff4u started in the year 2018 with the mission to empower people with technology. Ever since its inception the company knowledge has motivated and inspired the ignite souls to overcome the technical hurdles and foster their thinking and creativity. To provide all the information related to electronics and electrical engineering at one place. To connect all electronics engineering people all over the world. 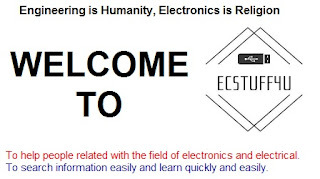 To help people related to the field of electronics and electrical. To search for information easily and learn quickly and easily. "A man with new ideas is a crank until he succeeds."